MANAMA: The recent confirmation of construction work on the Four Seasons Hotel in the Kingdom of Bahrain has signalled new optimism in the nation’s employment and real estate sectors. Situated at Bahrain Bay – the country’s highest-profile, master-planned $2.5 billion waterfront community – the 5-star hotel’s commitment to an April 2014 construction completion date is set to inject new jobs, new capital, and new optimism into several of Bahrain’s flagship sectors. As the latest in the five-star chain’s prestigious portfolio of international properties, the Four Seasons Hotel at Bahrain Bay will bring employment benefits to the nation’s workforce, confirmed Vincent. “The commencement of the main contract for the Four Seasons Bahrain Bay is seen as an important commitment to re-invigorating construction in Bahrain and bringing a fresh focus to real estate lending by local banks” Vincent commented. “In addition, the flow-on effects of more than 2,000 jobs during construction; participation by local Bahrain sub-contractors and suppliers during the development and more than 700 permanent jobs; will all serve to demonstrate a turnaround in the Bahrain economy”. At 201 meters tall, 50-storeys, and 263 guest rooms, the hotel complex is set to bolster Bahrain’s hospitality credentials, and set a new standard in luxury accommodation. Complete with five-star spa and leisure facilities, suspended ‘Sky Pod’ restaurant, first-class banqueting and conferencing capabilities, four fine dining outlets, and panoramic views for guestrooms and suites, the project has been designed to lead Bahrain’s hotel offerings into a new era. 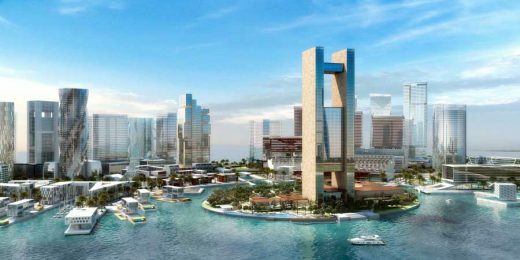 The project implementation will be co-ordinated by the Bahrain Bay management team, and as such the hotel’s construction will exhibit the same leading-edge contemporary design and project management efficiency that has positioned Bahrain Bay as the country’s highest profile waterfront community. Bahrain Bay is the Kingdom of Bahrain’s first master-planned mixed-use waterfront community, situated off the north-east coast of the capital Manama. The $2.5 billion development has a masterplan created by New York-based Skidmore, Owings & Merrill, and has been designed to create a fusion of residential, commercial, retail, tourism, and community facilities and public amenities. It has three anchor developments – Four Seasons Bahrain, Arcapita Headquarters, and Raffles City Bahrain – reflecting the global standard the project is setting for the Kingdom. It was launched in 2006, and has seen uninterrupted progress, with 65% of land parcels already sold. It is scheduled for a multi-phase completion with initial phases to start being completed from 2012. Four Seasons Hotel Bahrain is one of the global hotel chain’s 85+ worldwide five-star properties situated on an exclusive island at Bahrain Bay, off the north shore of the Kingdom of Bahrain. Currently under construction, it will feature 263 guest rooms, five-star spa and leisure facilities, suspended ‘Sky Pod’ restaurant, first-class banqueting and conferencing capabilities, four fine dining outlets, and panoramic views for guestrooms and suites. The main construction is scheduled to be completed in April 2014.